This is the last year for Operation IceBridge, NASA's most comprehensive airborne survey of ice change. Since the launch of its first Arctic campaign in spring 2009, IceBridge has enabled discoveries ranging from water aquifers hidden within snow in southeast Greenland, to the first map indicating where Now, for the first time since its inaugural flights a decade ago, while IceBridge is mapping Greenland's ice from the air, one of NASA's newest satellite missions, the Ice, Cloud and land Elevation Satellite-2 (ICESat-2), is simultaneously mapping that ice from space. The underflights of the new satellite in the Arctic will accomplish one of the final objectives of this airborne mission, which was designed to avoid a gap in measurements between the ICESat satellite mission that operated between 2003 and 2009, and its successor, ICESat-2, which launched last year. 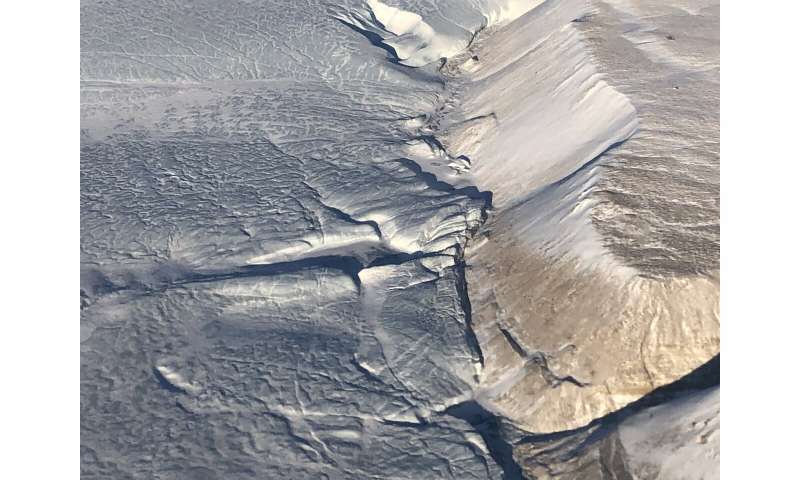 "We're finally connecting the different sets of measurements of ice elevation in the northern hemisphere—we're completing the bridge," said Joe MacGregor, IceBridge's project scientist and a glaciologist at NASA's Goddard Space Flight Center in Greenbelt, Maryland. On April 3, the IceBridge team carried out the first flight of its spring campaign with a survey of land ice over Devon Island, Canada. These research flights will continue until May 15 and add to IceBridge's wealth of measurements of fast-changing areas of the Greenland Ice Sheet and sea ice across the western basin of the Arctic Ocean. The IceBridge 2019 springtime flights use NASA Wallops Flight Facility's P-3 Orion aircraft. The plane carries a comprehensive instrument suite: two laser altimeters that measure ice surface elevation, two radar systems to study snow layers and the bedrock underneath the ice sheet, a high-resolution camera that generates georeferenced images of polar ice, a hyperspectral imager that records the brightness of the surface across a wide spectral range, and an infrared camera to measure the surface temperature of ice. This spring, to better align its objectives with ICESat-2, IceBridge will base all flights from Greenland and forego basing in Fairbanks, Alaska, a standard part of Arctic operations in years past. The first half of the campaign will focus mostly on sea ice and base out of Thule Air Base in northwestern Greenland. About three weeks later, the IceBridge team will transit to Kangerlussuaq, in southwestern Greenland, and from there fly over land ice targets. During this 6-week campaign, IceBridge expects to complete about 24 flights in total, 11 of which are of the highest priority and are repeated every year to gauge annual changes in elevation of land and sea ice. This year, following the launch of ICESat-2, IceBridge will not only attempt a few new targets but many of the longest-running surveys have also been tweaked to underfly the satellite directly wherever possible. IceBridge flight lines have been adjusted to either directly underfly the ICESat-2's ground track for longer distances (up to hundreds of miles) within a few hours or days of the satellite, or fly specific parallels (lines of equal latitude) where the satellite's tracks cross over each other within a few days—forming an X on the map whose center IceBridge targets. Both of these types of modifications will allow scientists to compare airborne and satellite measurements of ice height taken close together in time, a critical process in completing the altimetry "bridge" between missions. "These adjustments affect how we navigate, which flights we prioritize and how much of each flight we can dedicate to low-elevation surveying," MacGregor said. "But, they're essential for robust inter-comparison of IceBridge and ICESat-2 data. Even more important to IceBridge is that these adjustments also allow us to survey new terrain, such as ice caps in the Canadian Arctic and never-before-surveyed portions of the interior of Greenland." After this spring campaign, the IceBridge team plans to carry out two additional campaigns in 2019, one in the Arctic in late summer, to measure how much ice melted during the summer, and a second over Antarctica in the fall. Both surveys will use NASA Johnson Space Center's Gulfstream-V. These will be the final IceBridge flights—the end of an era of airborne observations that has catalogued an Arctic that has experienced rapid change—from the rapid thinning of many Greenland ocean-terminating outlet glaciers to the continued decline of the Arctic sea ice pack in extent, snow cover and thickness. "In terms of monitoring Arctic ice, IceBridge and its predecessor NASA airborne campaigns have produced a remarkable legacy that stretches back to 1993—more than a quarter century—beginning and continuing with the Airborne Topographic Mapper laser altimeter," MacGregor said. "With ICESat-2 now in orbit, collecting great data and hopefully lasting for many years, we can now map ongoing changes in polar ice in fine detail from space. That will allow NASA to refocus our airborne efforts on other types of measurements or other priority areas."